We propose that you stay at Golf Course Hotel Entebbe for two nights and the hotel will be picking you as well. • After a morning breakfast have a tour around Kampala visiting the different cultural sites starting from Naggalabi Corronation Site which has the real history and origin of the Buganda Kingdom. The Kasubi tombs – a traditional feature and the largest crypt in Africa, a special burial place for Buganda kings. Our guide will be jubilant to give you a brief and interesting narration of the site. 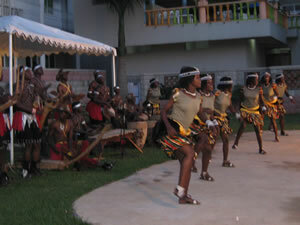 • The Uganda Museum – a historical feature with lots of colonial, cultural and traditional collections. • Namugongo Shrines – a historical and traditional feature. The place where the Ugandan Christians were murdered under the orders of king Mwanga in 1886. • Makerere University – visit the first and the oldest university in East Africa. • Namirembe Cathedral - the first and oldest religious feature that was constructed by the European missionaries. • Bahai temple – visit the biggest and only religious temple building of its kind on the African continent. • The craft village – place to buy African art, carvings, masks of your desire. After an early morning breakfast, cross the Nile to the Northern bank for a game drive as we transfer to Mbale via Soroti . You will be able to spot cape buffalo, elephant, roth child’s giraffe, lion, hartebeest, oribi, waterbuck, bohor reed buck, bushbuck, hyena and lucky enough will be able to see the leopard then drive to Mbale where we shall spend our night with the Jews at and Community Guest House. Today after breakfast, we shall take a tour of the Abayudaya schools then the Namanyonyi synagogue, back to the hotel for lunch, then later in the afternoon we shall meet the Mirembe Kawomera coffee farmers in Nangolo and learn more about coffee farming and processing.